If there’s an upside to Game of Thrones ending, it’s that the series’ incredible props and costumes are now available for public viewing. And where better to see them than the unofficial home of GoT, Belfast, Northern Ireland. The city, which served as the primary production location for the series, is the final stop for Game of Thrones: The Touring Exhibition. Guests begin their tour with a photo opportunity (one of several) in which they step in front of a green screen to have their picture taken with the largest of Daenerys Targaryen’s dragons, Drogon. From there, they enter the exhibit hall through a wintery scene, heading straight into the “Purple Wedding.” A fantastic way to start, Margaery Tyrell’s gorgeous wedding dress stands next to Joffrey Baratheon’s golden wardrobe and antlered crown. Those who have opted to pay for an audio device will hear behind-the-scenes commentary from key crew members including award-winning costume designer Michele Clapton, production designer Deborah Riley, weapons master Tommy Dunne. In their narration, the experts share first impressions of sets like Castle Black, how costumes such as Cersei’s Season 7 dress (designed with the same fabric as her father Tywin’s earlier-season garment) came to be, and what goes into making a glass sword for the White Walkers. Additional highlights include Oathkeeper, Ygritte’s bow and arrow, the Catspaw dagger, Jaime’s golden hand, the Hound’s armor, Oberyn Martell’s and Sansa Stark’s ornate costumes, and Daenerys’ stunning jewelry — each created with their stories in mind. 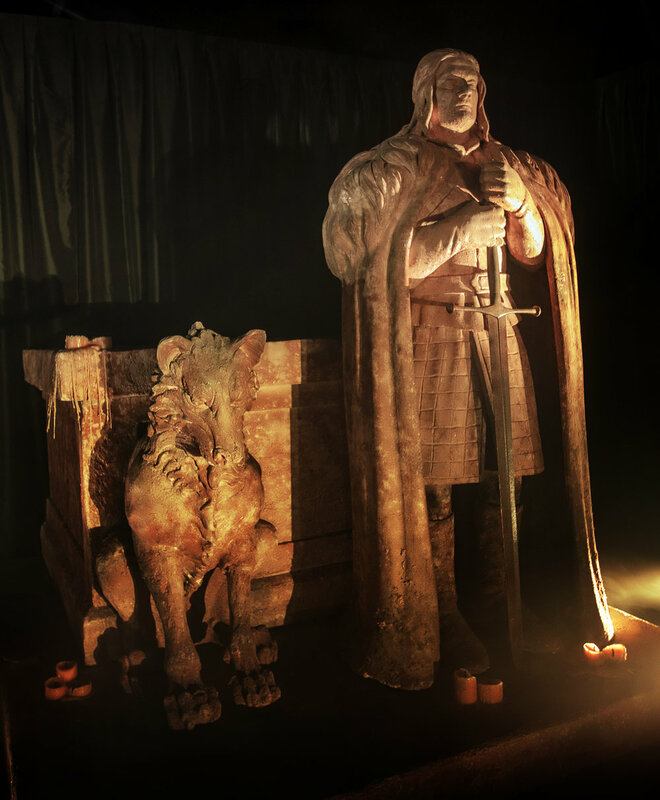 Given the city’s unique tie to Game of Thrones, the Belfast-stop of the exhibit boasts two exclusive additions — the first, a room devoted entirely to the Winterfell crypt statues, including those of Ned and Lyanna Stark, and the second, a walk amongst the spectacular dragon skulls found in the Red Keep. Fans will be struck by the sheer massiveness of the skulls, including one close to the size of a helicopter. No tour would be complete without photo ops, and the exhibition does not disappoint. Visitors are given the option to pose with recreations of Ned Stark’s Ice, Arya Stark’s Needle, and Jon Snow’s Longclaw, as well as placing themselves in the Hall of Faces, ascending the Wall, and, of course, upon the Iron Throne. On display until September 2019, Game of Thrones: The Touring Exhibition gives fans what they want: a chance to get close to the artistry that went into making the hit series and immerse themselves into the world of Westeros. Check out images below. The final season of Game of Thrones premieres April 14 at 9 pm. Find out more about Season 8 at HBO.com.